There are 243 posts in this topic. You are on page 5 of 5. Been busy with the Ohio Show and trying to get caught up on some outdoor chores the past few days. I did manage to get the ball gates and plastics set up in the waterfall area. 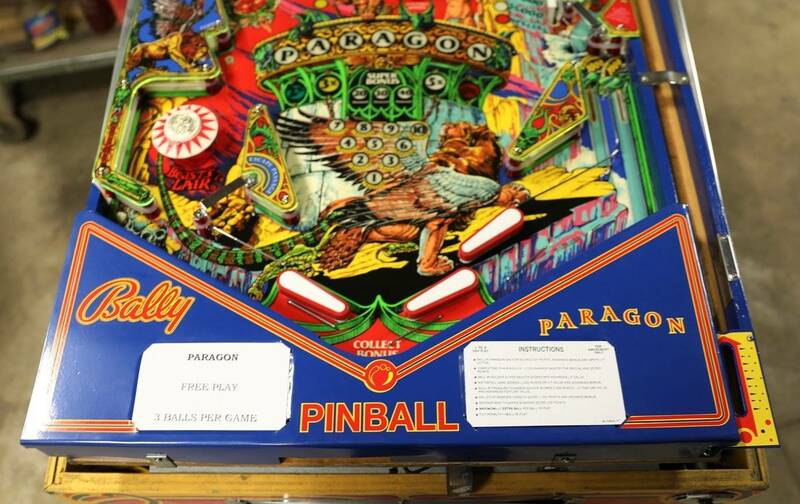 If you've noticed the green under the plastics that is a set of Convolux protectors I ordered from Freddy's Pinball Paradise. So far I like them as (to my eye) they compliment the bright green on the playfield. Unfortunately when my order shipped one of the protectors was missing -- the piece under the treasure chamber -- but after contacting them a replacement is supposedly being shipped. Not sure how long I will be waiting as they are based in Germany. I'm also using plated 6-32 acorn nuts to top the stud posts vs. the rubber caps. If I had a favorite color it would be Chrome. Officially installed the apron today. Also installed pop bumper caps with gold on the top vs. black. Look close, its gold. Honest! A view of the current status of things. Somehow when my order from PBR shipped the set of 2" flippers were left out (why does this seem to be a trend lately? ). My original is much too yellow compared to the main flipper bats for me to be happy with. 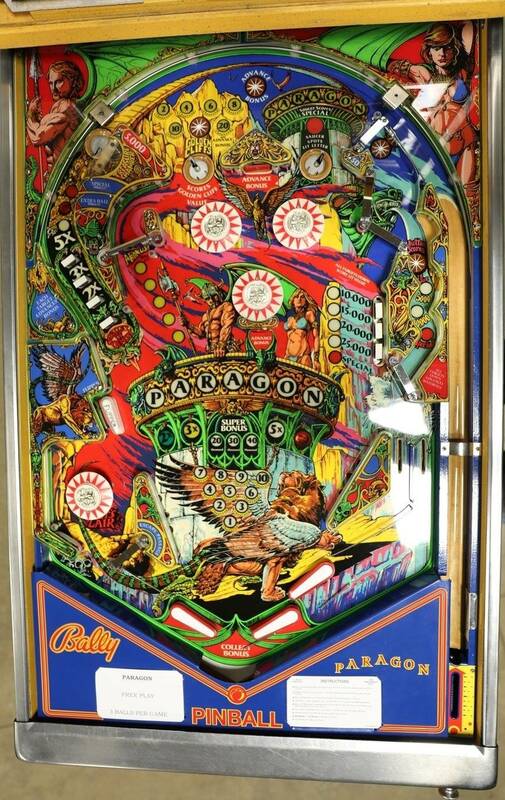 PBR has stepped up and sent them out yesterday; that is the last bit to install before dropping the playfield down into the cabinet. 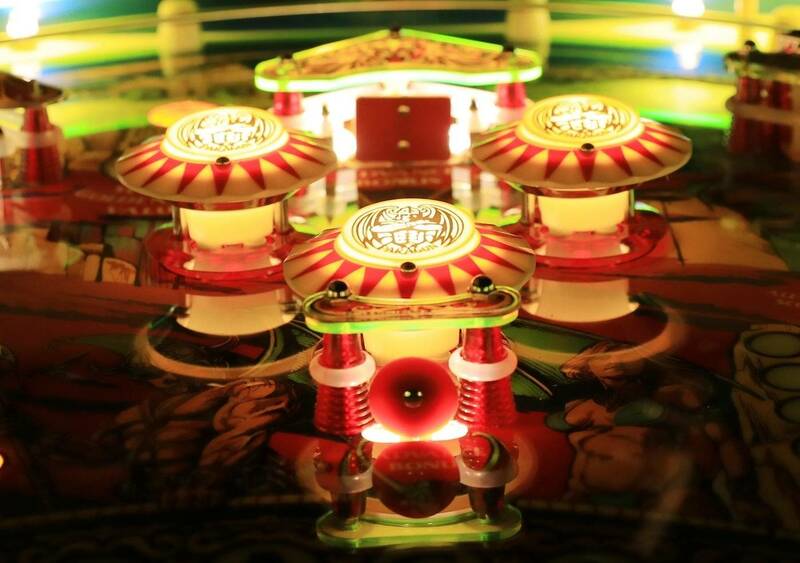 Then, once my missing plastic protector arrives, the playfield will be complete. More or less. I will try to pass the time by repining the connectors on all the harnesses. Fun times! Stripped the upper cabinet and gave it the best cleaning I could today. I am always amazed at the areas I find drips/where liquids have been spilled. Pretty sure there was dried blood in a couple spots. It has a few more scuffs than the lower cabinet but the colors are still bright and should give off a nice vintage vibe. Found a good use for all those burned up bulbs (before tossing them ) and gave the display board a new bright coat of white. Tempted to join the cabinets once again. . . but need to re-pin those connectors first. I've definitely bled on a few of the games that I've owned. Thos drop target assemblies have sharp edges! A rainy Friday allotted time to re-pin some connectors. One of my wiser acquisitions has been the ratcheting crimper. The task of installing the new pins is much simpler and more efficient with it. I always keep the schematics handy to keep the wires in their proper spots -- I get better at reading them each time I look them over. My two inch flipper bats arrived from PBR so of course it was secured in place. Why the translucent band vs. red? Because I somehow ordered a 3/4" red band from Titan vs. the proper 1" size. I will swap it at some point, but I don't hate how the translucent looks. 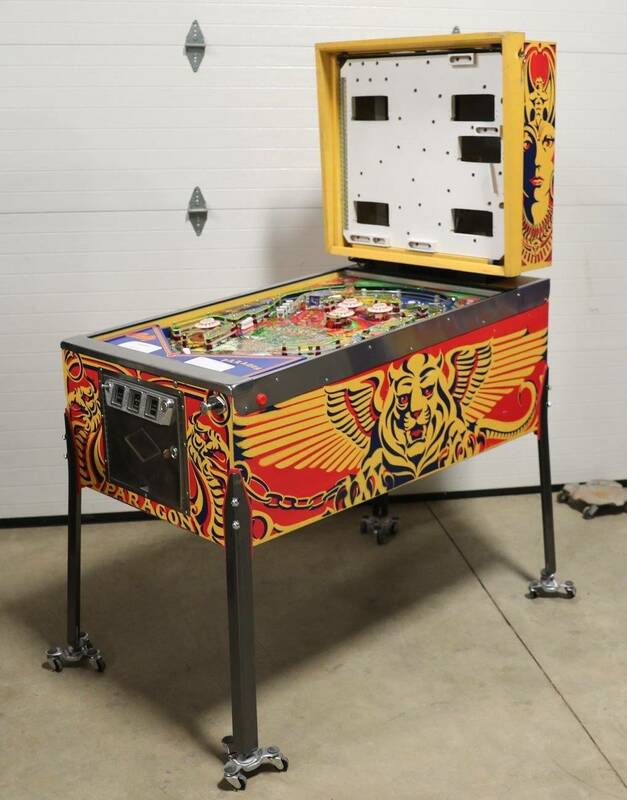 Dropped the playfield into place in the cabinet. After who knows how many years the upper and lower cabinets are secured back together. Starting to look like a Pinball Machine! I took things a step further and installed my new rectifier board. I plugged in the cabinet harness to the rectifier and flipped the switch. . . and promptly heard a pop and saw some sparks. I flipped the switch off nearly as quickly as I had turned it on and took things apart to investigate the source of the problem. 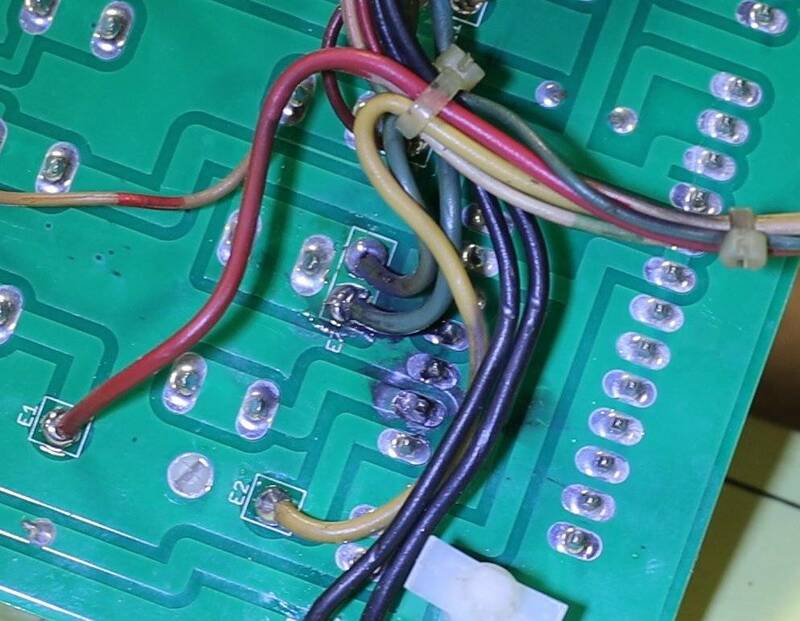 It appeared to be the 120V supply to the rectifier; examination of the back of the board revealed a smoked area as well as small piece of solder blown out from the header pin. This picture was after I cleaned the area up with a cotton tipped swab. I checked and rechecked everything. The 120V was correct and all the wires were in the correct locations in the connector. I could not see any other areas of compromise on the board and the fuse were still intact. They say insanity is repeating the same thing over and expecting a different result. . . but I could not locate the source of the problem so I plugged the cab harness in, held my breath, and tried again. No sparks this time. No burning smell. No popping. All the LEDs on my rectifier board where lit green and all test points checked out ok. ????? The only thought I have is some small piece of solder had somehow jumped across the pins? If anyone has other thoughts I am all ears. 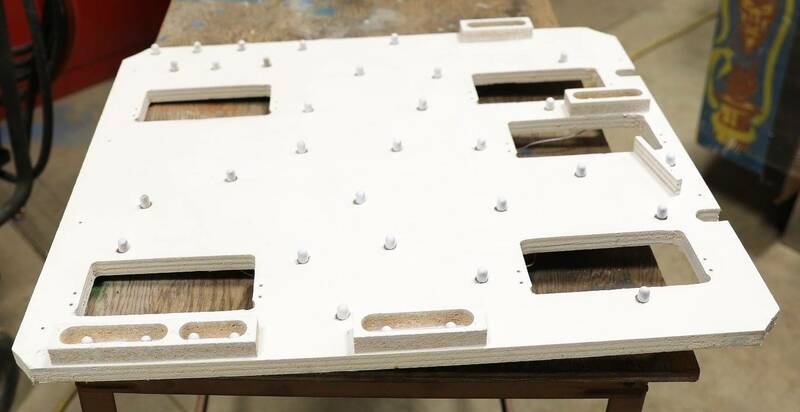 There was no contact between the back of the board and the mounting plate. Pushing things even farther I turned the switch off, plugged the playfield harness in, and turned it back on. No issues. I waited around for a bit with the switch left on. . . to make sure nothing burst into flames. 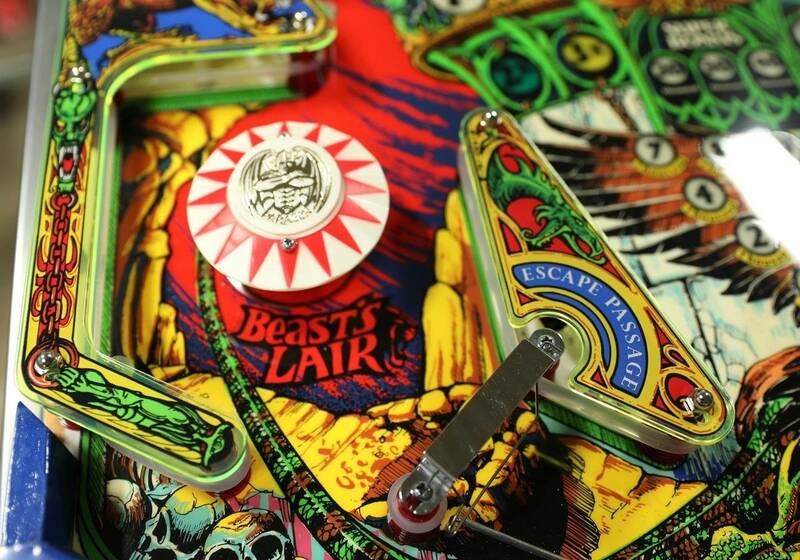 To pass the time I tried taking a few more playfield pictures. Shop lights on. Shop lights off. Different camera settings. I am thinking I need to swap out the clear LEDs with frosted for the GI. . . to make things a little easier on the eyes. Still waiting for my last plastic protector, but there is still a lot to do before we can worry about the little things. Looking great. Where did you get the crimper? Thanks as well. I know you can get them on Amazon, but I believe I ordered mine thru E-bay. The model is a Hanlong HT-225D. So glad to see you have the cage for that transformer. So many machines are missing that part but for some reason I love them. Had just enough time to install boards and harnesses this weekend. I started just by plugging J3 into the Solenoid Driver and turning the game on. Once my test point voltages all checked out I hooked everything else up. Once powered up the game finally has some life to it. Definitely some bugs to work out before I start flipping though. So far some switches are not registering even though I was sure to set gaps when the playfield was out. With the Alltek lamp driver I am still having some LED flicker from the insert bulbs -- I wired it in as instructed to avoid the flicker. I had the game reset several times when flipping the right flipper. I hope to dig into this more thru the week; I will start with why my 12V may be dropping to allow a reset on the MPU. Probably something I am overlooking on the SD board or perhaps something in my wiring. On the plus side all the solenoids are firing, drop targets are registering/resetting, flippers are flipping, and sounds are dinging. Displays are working and registering scores as I manually trigger items on the playfield. My original backglass has some obvious cracks/bubbling across the bottom area. I've ordered a new one from CPR -- Kevin has assured me that the new digital printing process should eliminate the washed out look past offerings have dealt with. We shall see! ‘Tis a thing of beauty! Coaxed a bit more life out of the machine today, but the day was not without some challenges. I was pleased to find my missing plastic protector in the mailbox this afternoon. With that installed the playfield is nearly complete. About the only other change would be to snap a red ring on the mini flipper. I installed the plastic and rolled the game out for a couple pictures in the daylight. 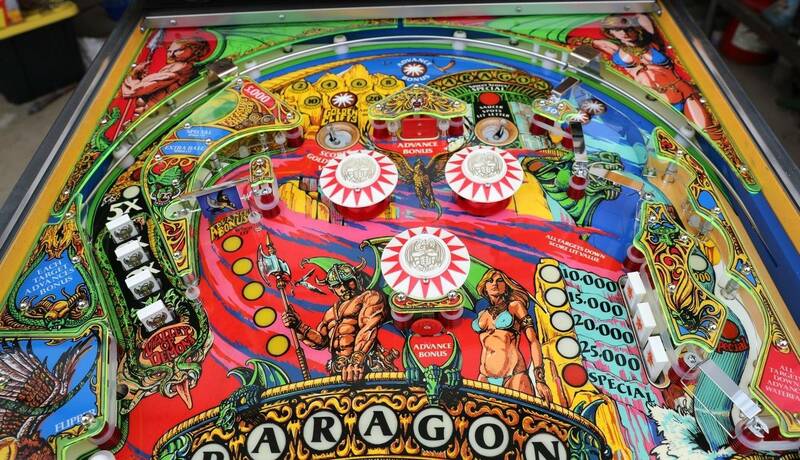 A pretty playfield is not much good if the game is not playing 100% though. 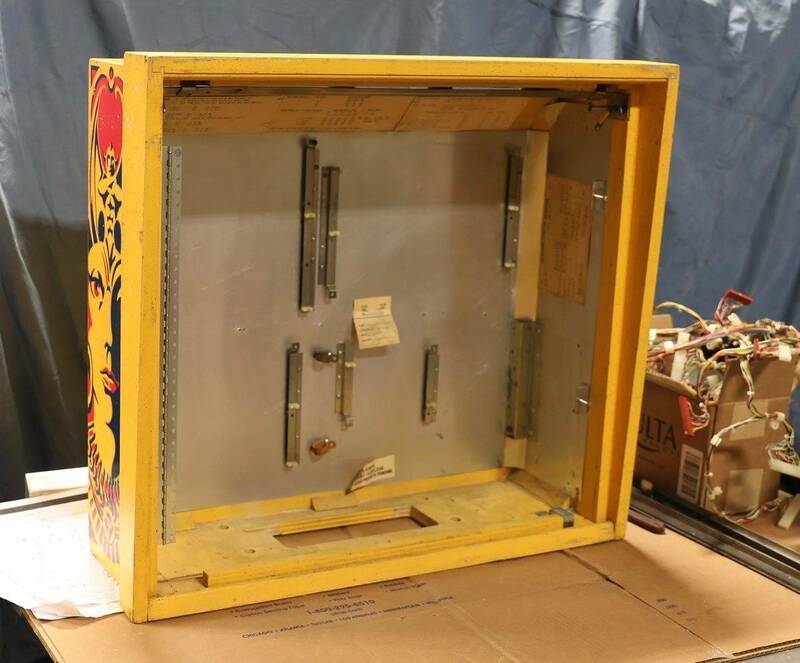 I lifted the playfield up to investigate the switches that were not registering and something odd happened. I checked the switches and everything was gapped correctly. I turned the game on with the playfield up. . . and I noticed the LEDs were not flickering anymore. 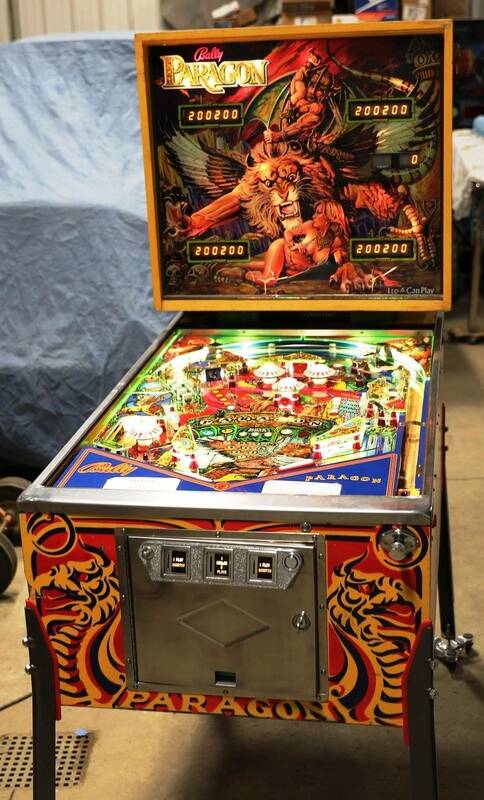 I powered down, rested the playfield back in place, and powered back on. . . now everything is registering as it should! I have no idea why, I am just glad that it is working. I was actually able to get a couple games in! I struggled to get over 100,000 the first couple, and I need a lot more practice before I get the inline drop target shot down. That is not where the day's challenges come in though. About midway thru the fourth game the machine decided to reset again -- I am still thinking it is linked to the right flipper. I had checked all the test points on the MPU, SD, and Rectifier boards with no issue. I half wonder if it has something to do with that initial pop the rectifier experienced, but I reflowed the solder at the header pin and have had no other issues since. I played four more or so games before the machine reset again with the right flipper. My other challenge was a bit more devastating. 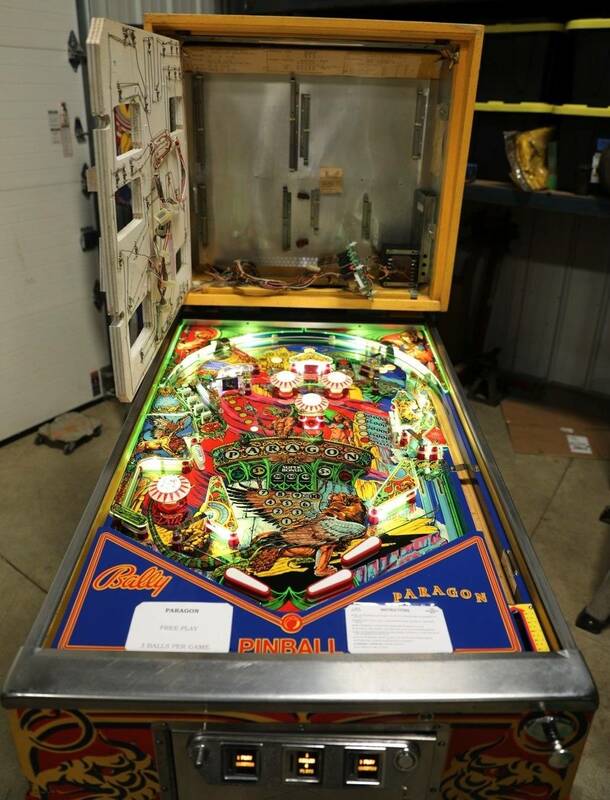 I have never had this happen before, but I picked up the playfield glass to install it. While carrying it over to the machine I felt a pop and the glass in my hands was gone! It ended up in a pile on the floor. Now I am one that will admit when he has been foolish and cut corners -- but I was actually being super careful with this glass due to its oddball size and I was thinking to myself I don't have a spare to replace it with. I did not bump it on anything, no rings on the finger, etc. I've set other glass down on the concrete, flexed glass now and again when pulling/installing in a game, and other abuses that have never resulted in such sadness. I suppose I should just be happy it did not pop over the game. It did have a number of scratches on it anyway. . . maybe a sign that a new piece is meant to be. I will try to call the local glass shop tomorrow to see if they can cut and temper the size I need. Yep, a big no no. Never Stand glass on concrete. The Pin is looking the goods though. That's just the thing. . . I never had this piece near the concrete. Simply broke in my hands while carrying it from the shelf I was storing it on. The surprise of the situation will make sure I never touch any other glass to the ground though! Looks great can't wait to get mine up and running. 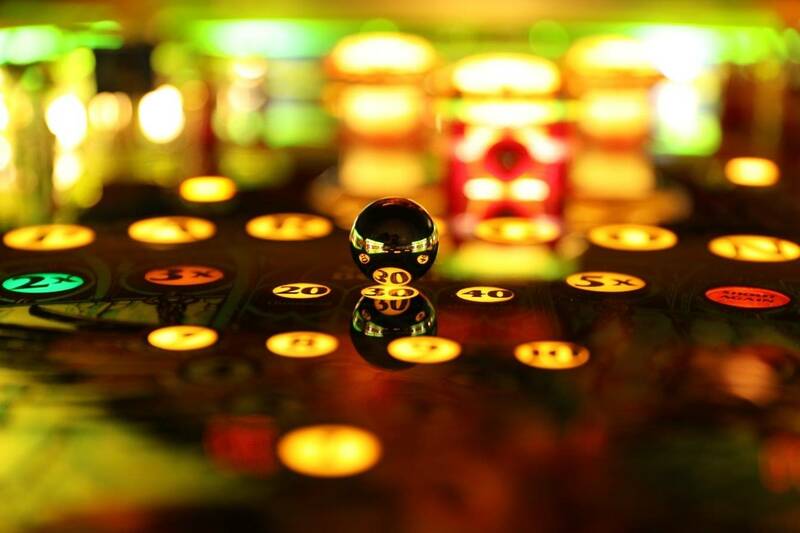 In addition to pinball one of my other interests is photography. I tried staging a couple photographs to highlight some details. I like this one due to the tree you can see outside the garage door in the ball. The reflection of the bumpers gives the ball a deformed look. 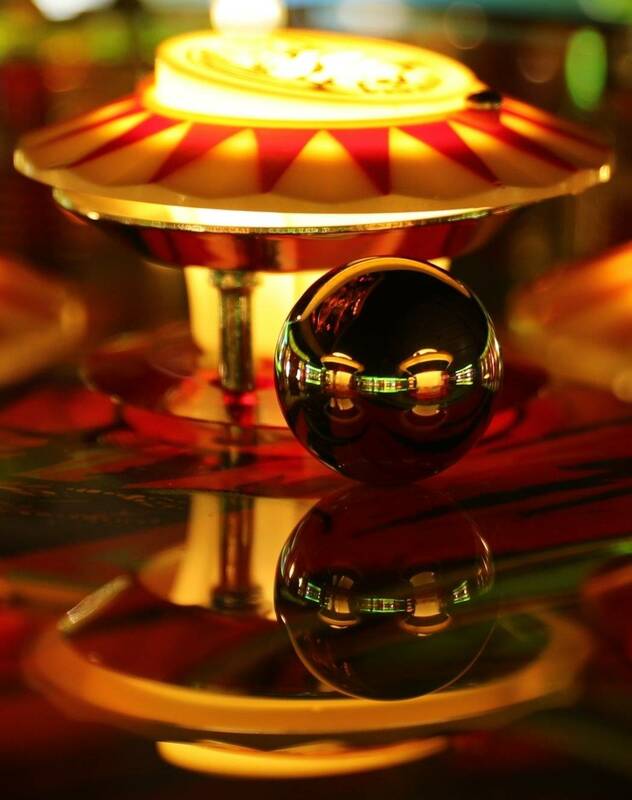 Seeing the reflection in the playfield of the reflection in the ball. 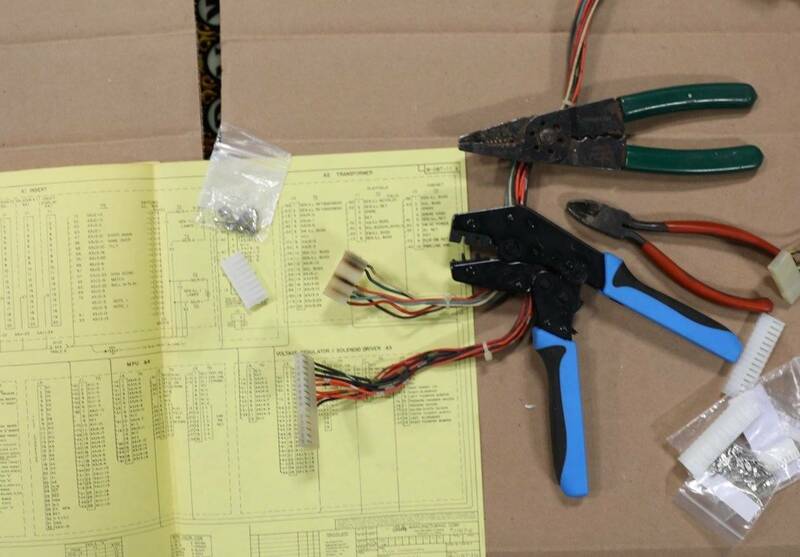 . .
For your flipper reset issue, have you replaced all the various switch capacitors? I cannot recall from earlier in the thread. When the originals get really old the wrong switches can be read by the MPU on the same strobe. Do you have any false coils firing? Switch capacitors were replaced and no coils/pops firing in conjunction with the flippers. On occasion I hear a louder hum from the displays/backbox (when the displays light). I have the high voltage set between 160-170. The hum comes and goes -- sometimes if I bump the machine slightly, sometimes if I open the coin door, sometimes if I tap on the backbox it will start or stop and then cycle when the displays are lit. I still have several things to check thru. 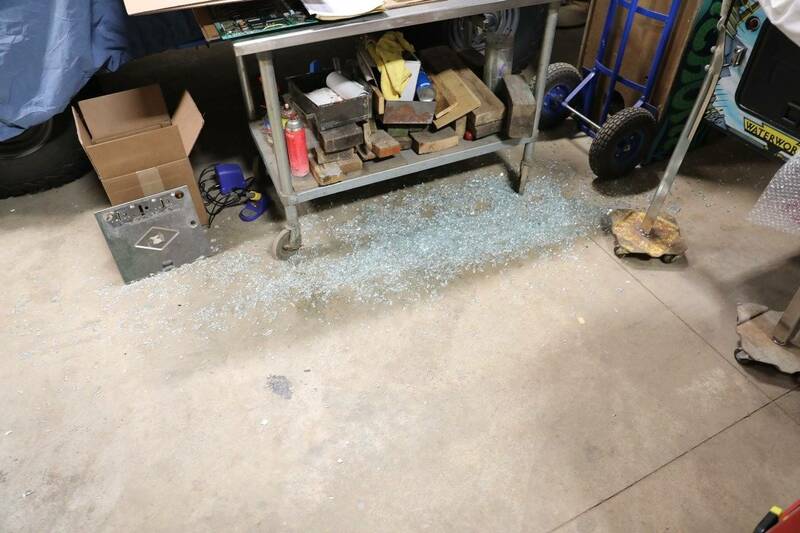 Good news is the local glass shop says they can cut a new playfield piece to size no problem. 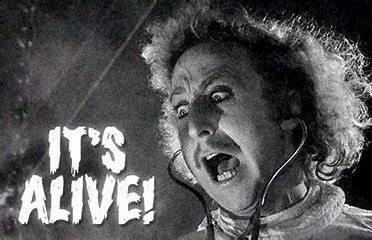 Also received an e-mail from CPR stating that the new backglass is on its way. 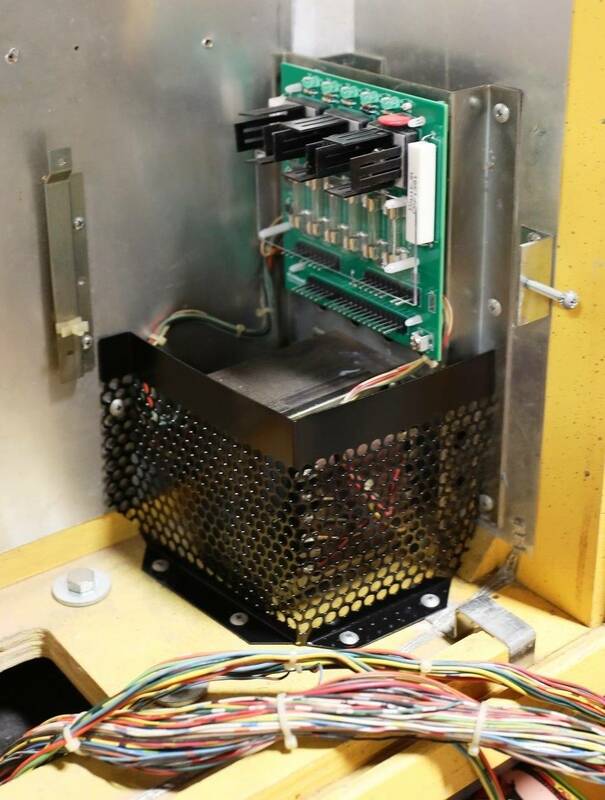 Usually the phantom coil firings are noticeable at the level where a game reset might occur. I had a Xenon doing the occasional freeze and reboot. In my case I realized it was a false tilt/slam switch reading as opposed to a straight reboot. 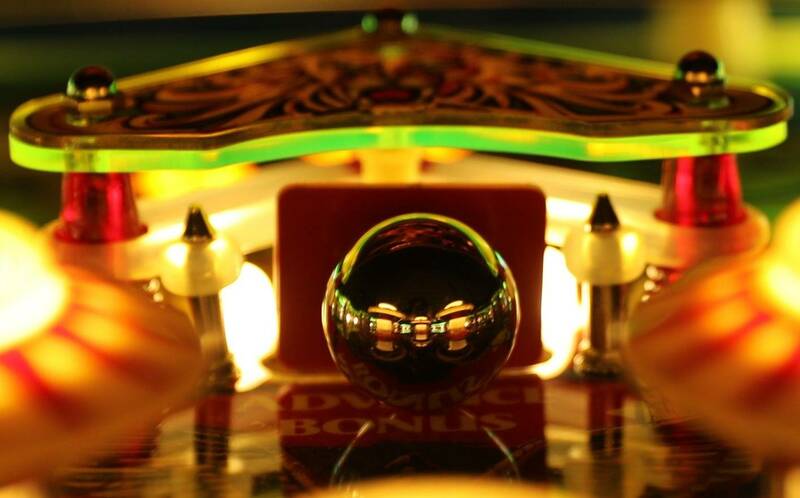 Most Bally's will make a distinct sound effect when you actuate a slam switch where a true reboot is silent. Do you recall what happened in your case? Just a random reset during normal game play, triggered by the right flipper button. I double checked the slam switches in the cabinet, on the door, and under the playfield -- made sure spacings were normal. Traced the cabinet and playfield flipper wires as best I could with nothing unusual found. No sound effects like you would have with a tilt or slam switch when the game resets. Game just stops, lights out, flippers dead, and the MPU reboots. I have nearly all the connectors repined -- just a couple of the lamp wires left while I am waiting for more .100 pins to arrive. My next step might be to swap out the solenoid driver board to see if something quirky is happening there. Just a guess, possibly the 5v to the MPU dropping a bit under load? Not sure how it works on Allteks, but I thought it was the 12V dropping too low that triggered a reset on the original MPUs? I know the 5V is important as well and that is the head scratcher -- everything checks out nice and steady when testing via meter. I rebuilt the high voltage and 5V section of the SD Board but there is always a chance I flubbed something up. Perhaps something with the double right flipper is having an effect on the SD board that carries over to the MPU? I will report back once I've swapped out the SD for one I know that has no issues. Thanks for those, some of them have found a home in my desktop background folder! No problem. 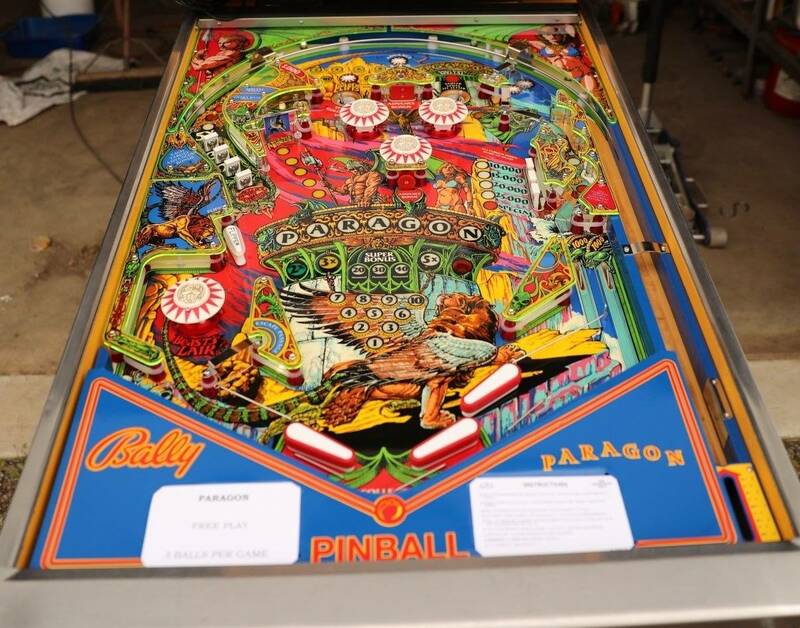 Getting the playfield level to keep the ball from rolling off was a task in itself. Well, over lunch I swapped in an Alltek Solenoid Driver I robbed from another game. Five games in I was doing good with no resets. . . until the game reset. I like the Alltek boards because of the LEDs that provide some diagnostic value. The thing that is confusing me a bit is the power to everything appears to stay on. I played the game with the backbox door open so I could watch any changes that might occur on the boards. At no time did any LEDs change, blink, etc, when the game would reset (except those on the MPU of course). The reset is still activated by the right flipper. I watched under the playfield while I flipped and also watched the boards in the backbox as I flipped. No sounds associated with the reset -- it all seems to be isolated to the MPU. Most of today was observation -- when I have more time tomorrow or this weekend I will get the meter out and recheck my voltages again despite what the little green lights on the board say. I am sure the fix is simple enough. . . but I am running out of ideas on what to look at next! those pictures would make beautiful wall art, really awesome! Exact same issue as my Xenon. I am going to bet the phantom firing issue is actually the issue despite not seeing coils do anything. That link I posted earlier was the culmination of a ton of testing. 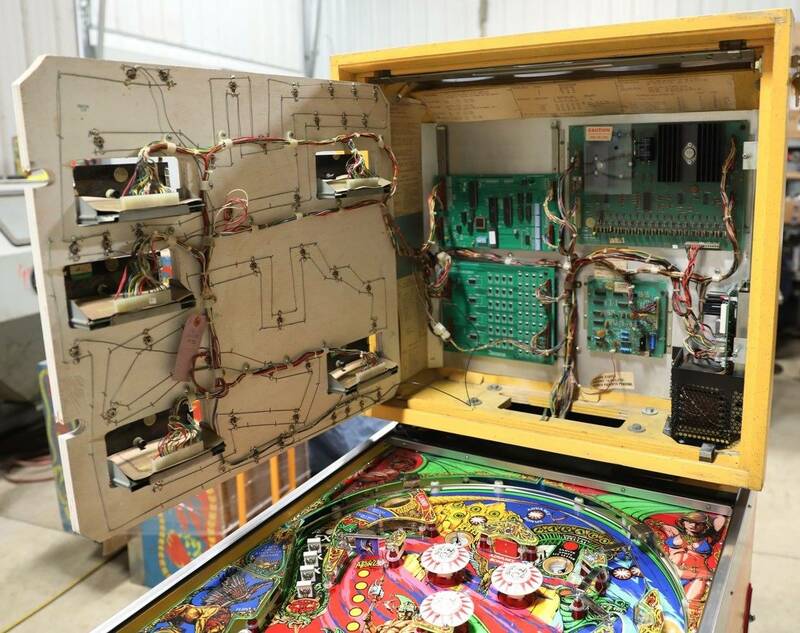 The flipper wiring is in parallel with a ton of switch lines in the cabinet and in the playfield. On Xenon (and an Embryon that had the same issue) I had to pull out the flipper wiring in the cabinet from the harness and keep is just a small distance away from the original harness. Whoever designed the harness to combine high power and switching was nuts. Over the years the carbon power from the various coils get into the harness and its inductive properties keep getting worse. I was having a similar problem recently with mpu locking up but also sending random messages to SD board that would also occasionally lock on a solenoid and blow a fuse. Turned out to be 5v supply to mpu. Levels were good at power supply but less than 4.5v on the test point of mpu. I just needed to clean and reseat my 5v connector and mpu 5v came back up and locking went away. Do you have a digital volt meter with min / max mode. If you have grabber leads, hang them on the 5V and GND test points on the MPU and play a bunch of games. When it has an issue, look at the readings and see what voltage it drops to. Do the same for the 12 volt test point. You have enough room to leave your meter in the head when playing. I bet you have a voltage dipping too low. Love following this. As a paragon fan and owner, it just doesn't get much better! I did not do the 12V test point, but that will give me something to do tomorrow. I do appreciate all the comments and suggestions. . . we will figure it out sooner or later! Beautiful work! I'm putting my project Paragon back together and looking at your pictures I realized my game is missing the cage that protects the transformer in the back box. Fortunately I have some perforated metal to fabricate one! Thanks for posting. You need to use min / max mode if you meter has it. The dropout might be so fast, the display can't show the change in a timely manner. The min / max mode will log the info into memory and let you see it as you push the button to cycle through the results. If you have a drop in the 5V, it will be quick. Then you can start looking at the regulator on the solenoid driver board. The 11.9 unregulated feeds the 5V regulator. Maybe something is marginal there and flaking out. If it continues, move it to the Early SS forum and ask. I will have to give the meter a look. It is a decent one, but I am not as well versed in using it as some of my other tools. I tried to eliminate the Solenoid Driver Board as an issue by swapping in a newer Alltek, if there is something flaky it must be happening before reaching the SD. I tried something simple today -- a lot of my automotive electrical woes can be due to bad grounding. I snuck in an extra grounding wire from the attachment point (in the cabinet) on the MPU down to the ground braid. . . but it didn't help. I just may give the SS Forum a try once I've exhausted my ideas. Thanks for the guidance. Happy to help. If you post a picture of your meter, I may be able to guide you. 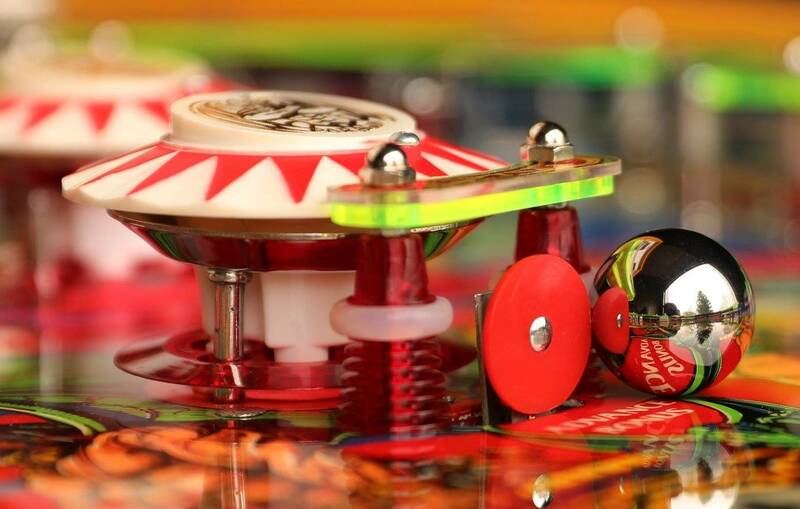 Have you tried a different coil on the right flipper? I'm new to this, but it sounds like you have an intermittent dead short in the right flipper. Either that or the flipper button for the right flipper is grounding out sometimes. I do believe my next step will be to replace both right flipper coils (or I could start with the diodes). I was able to talk with Dave from Alltek today and he seems to think we have more of an issue between the coil and the boards vs. power supply (but I have not ruled anything out yet!). I did swap out Alltek MPUs with no changes, so I know the boards are not at fault. 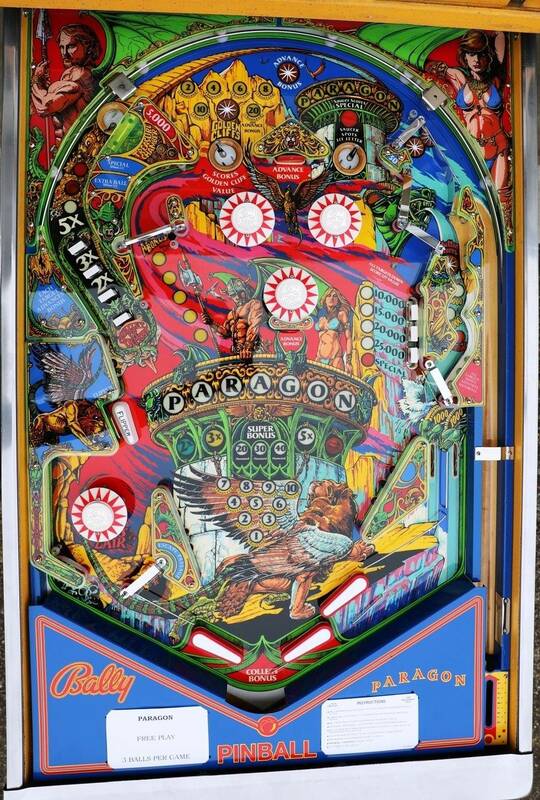 With the game in play mode I had the playfield raised and shook, wiggled, poked various areas under the playfield with no issues/resets. I looked over the flipper button switch and it is clear of everything as far as I can tell. Even if the tip of the screw holding the flipper button backing plate was somehow touching the metal side rail the switch is clear of it and I doubt the plastic button would act as a conductor. I've examined the harnesses as best I can between the flipper buttons, boards, and flipper coils with no areas of compromise. I had washed everything but the playfield harness in the dishwasher and even it (playfield harness) is rather clean. Eventually I will eliminate enough possibilities to find a solution. On a side note I am enjoying playing the game. . . hesitating using the right flipper takes a bit of fun out of it though. Paragon is definitely one of my favorites. It’s easy to play and difficult to master. It doesn’t hurt that it also has an unforgettable art package.